A Sandy Survivor: Muse-Eek Publishing Releases “Lavadura” (MSK 300) the CD that Nearly Got Drowned. October 22, 2012: one of the maintenance men at New York City’s artist residence complex at Westbeth was laying down sandbags, preparing the studios that lined the city block sized building’s basement for what was reported to be a “super storm.” He heard a loud noise and looked down the long corridor leading to the exit and saw a 3 foot high wall of water approaching him. By the time it reached him, it was 5 feet high, and had swept him off his feet, and the lights had gone out. The water continued to rise, pressing all the exit doors shut, until he found one that had been left open. He managed to escape with his life. Since then many stories have been written about the damage done to the studios in Westbeth. No one had been prepared for the ferocity of the surge, and countless works of art, instruments and equipment, left to soak in a combination of saltwater, sewage and heating oil for a week, were damaged beyond repair. As Bruce Arnold slogged through the heap of toxic slime and filth that had once been his state of the art recording and rehearsal studio, he realized that not only had he lost material possessions, but the files of the CD he had been working on for over a year were history. A back injury had prevented him from bringing his backup drives home; along with many precious sessions, he had nothing left of “Lavadura” (Dirty Water) a CD he had named without ever realizing its implications. 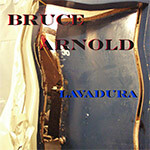 To hear or purchase music from this CD please visit the Lavadura page at the record company Muse Eek Recordings.